A helium neon laser, Nikon imaging lenses, Horiba micro-HR motorized monochromator, and a DLP-based arbitrary spectrum generator. These are just some of the optical sensing and spectral measurement tools you will find in the Optical Sensing Lab (OSL). With a background in optics, Dr. Michael Kudenov started the OSL to explore the cross-field’s capabilities to implement emerging technologies and see how we can use them to make optical systems smaller, faster and more capable. “Primarily, what we focus on is optical instrumentation. So, our primary goals are to develop smaller sensors that are more capable or developing sensors that exploit new capabilities. 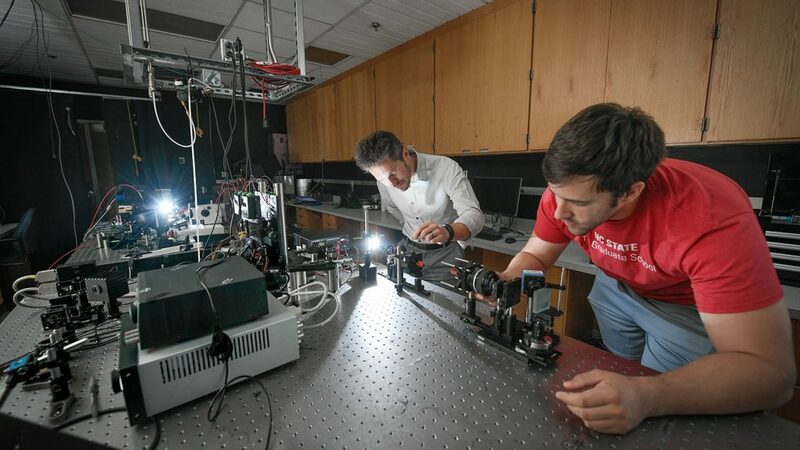 Also, implementing emerging technologies into optical systems,” said Kudenov, an associate professor in the Department of Electrical and Computer Engineering (ECE). 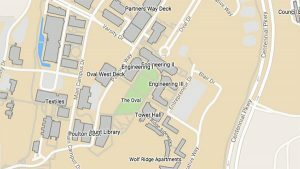 Located in the Monteith Research Center on NC State’s Centennial Campus, the lab’s major research area is in spectral and polarimetric imaging as it applies to both remote sensing and biomedical imaging applications. Through incorporating novel Polarization Grating (PG) technologies into spectral and polarimetric sensors, the researchers in OSL are increasing the sensor’s spatial, spectral or radiometric performance, or reducing the sensor’s overall size or cost. Dr. Michael Escuti, professor in ECE, is a collaborator on the work. Additionally, emphasis is given on the development of ultra-compact sensors with novel capabilities. An example is the ability to passively measure velocity at higher signal-to-noise ratios than were before possible. From a remote sensing perspective, it can be used to quantify chemicals in the environment, perform quality control in industrial and commercial manufacturing processes, assess water quality and vegetation health, identify targets, and for mineral mapping. Meanwhile, polarimetric sensing can be used to enhance a target’s contrast in cluttered backgrounds, measure surface roughness and quantify aerosols in the atmosphere. The lab’s capabilities also expand into biomedical imaging. Kudenov has worked with UNC Chapel Hill researcher Dr. Spencer Smith and assisted in his high-speed femtosecond microscopy. OSL researchers helped optimize objective lenses for brain imaging in mice. In this process, glass slides were placed on the brains of test mice. Once under the microscope, the mice were given visual stimuli. The lenses were then used to examine how the neuron firing pattern in the visual cortex correlates to other regions of the brain in response to different visual stimuli. Ongoing projects for the lab branch into multiple fields and areas, including remote detection and identification of projectiles, retinal spectroscopy and polarimetry for glaucoma detection, satellite tracking and orbital prediction, hypersonic wind tunnel testing and imaging, and real-time monitoring of thermal spray processes. And the applications do not stop there. Kudenov has been working with collaborators in the College of Agriculture and Life Sciences to study these types of applications. In the future, Kudenov would like to see more research in the areas of ultra-spectral imaging and advanced camera imaging array technologies. “Moving from 2D to 3D imaging camera arrays may open a new paradigm for measuring information,” Kudenov shared. Beyond conventional 2D silicon array detector technology, as is found in all cell phone cameras, he and Dr. Brendan O’Connor, associate professor in the Department of Mechanical and Aerospace Engineering, are creating new devices that could enable this vision. Based on organic light detectors, they offer similar architectures to retinas found in biology — specifically, the Mantis shrimp. In these biological systems, light sensing cells (detectors) are cascaded in more complex 3D structures, thereby enabling enhanced color and/or polarimetric vision sensing.